As a market leader in innovative engineering, EFC have designed and built an easily transportable, self-erecting mast for use on fixed platforms. Aftermarket support has been identified as a key service element, it is critical to our client’s long term success for support to be available once CAPEX equipment has been installed and commissioned. EFC Group provides standard and bespoke hydraulic control and hot line panels. These are multi-purpose units for control and testing any hydraulic actuated equipment. High and Low Pressure test units are provided by EFC Group. Whether they are bespoke or standard the Pressure Test Unit is designed to pressure test critical Well Control Assemblies. The Unit is generally used for testing; BOPs, riser lines as well as individual system components such as; valves, valve systems, manifolds and hoses. 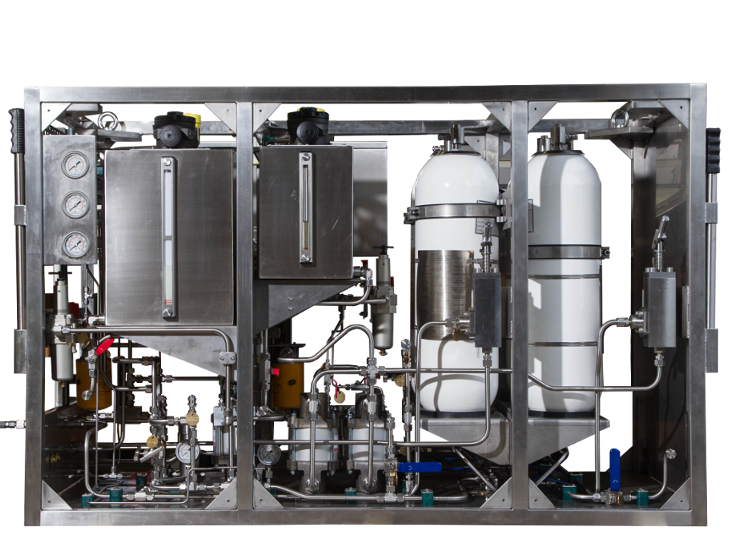 Our HPUs provide a clean, stable supply of Hydraulic fluid to either topside or subsea equipment. Our systems are manufactured in accordance with client specifications. Our standard range of HPUs include; 3,000psi, 5,000psi, 10,000psi, 15,000psi and 22,500psi power units. Units can be specified to include independently regulated lines to allow the testing of different valves from one source. All units are either stainless steel or painted to marine specification, equipped with forklift pockets and padeyes, as required. Display 8" finescale, cascaded gauge display high resolution pressure reading to 22,500 PSI. Interface User interface mimic panel. Pressure Regulator Regular maintains constant flow rate despite variable pressure. Adjustable set point for pressure. Chart Recorder Electronic or mechanical chart recorder. Safety Flame retardant, low halogen cables. Maintenance Friendly Simplified equipment layout to aid maintenance. Maneuverability Forklift pockets and padeyes. Durability Constructed from stainless steel. ATEX, IECEx, NORSOK and DNV Certification as required.